The founder and CEO of Nobis Engineering will step into a different role this month, paving the way for new leadership. Abhijit “Nannu” Nobis will step aside as CEO and serve in the role as Chief Strategy Officer and Chairman of the Board. Nobis Engineering President Ken Koornneef will then assume the role of CEO and President, overseeing the overall management of the company and setting the course for the future. As he steps away from oversight of the day-to-day operations of the company, Nannu Nobis will focus more on providing guidance and strategic advice to company leadership through this transition and in creating the long-term vision of the company. “Ken has played a vital role in shaping Nobis’ commitment to our clients, values, and culture of empowered employee-owners. As CEO, Ken will draw on his vision, while ensuring our commitment to clients, employees, and the communities we do business in,” said Nobis. Founded in 1988, the Nobis Engineering is a multidisciplinary engineering consulting firm with offices in Concord, NH, Lowell, MA, and Naugatuck, CT, with about 90 employees. Nobis serves private and governmental clients throughout the northeast and mid-Atlantic areas, offering specialized civil engineering, geotechnical engineering, environmental investigation, clean up, and permitting services. This change in leadership will not impact the high-quality service Nobis has long provided to customers. 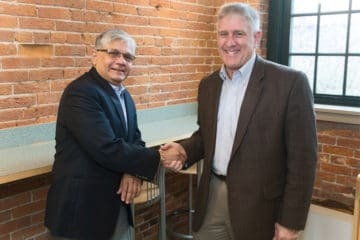 “Nobis Engineering has long had close ties to many communities throughout New England, and I expect those close connections to continue,” said Koornneef.